The fight against voter suppression continues: Voter ID requirements in Pennsylvania and Mississippi were blocked on Tuesday. Voters in Pennsylvania will not have to present a state-approved ID at the polls, and Mississippi’s law is under review and will not be in effect this November. On Tuesday night, conservative news site The Daily Caller released what it had hyped as an “exclusiveâ€ video, showing then-presidential candidate Barack Obama speaking at Hampton University to black clergy members in 2007. The Caller described Obama’s speech as “racially chargedâ€ and criticized him for using an “accent.â€ It turns out that the video was not that exclusive after all, as the speech had already been covered by the media at the time. The Obamas celebrated their 20th wedding anniversary on Wednesday, sending out tweets to let the world know about their special day. They had to postpone any plans until the weekend, however, because President Obama had a big night ahead. 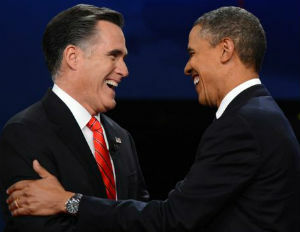 Obama and Mitt Romney went head-to-head Wednesday night in what was the first of three presidential debates. Most of the media and political commentators have declared Romney to be the winner, applauding him for displaying confidence and aggression while criticizing Obama for what was viewed as a “flat, uninspired and defensiveâ€ showing. Obama and Romney will debate again in two weeks, this time in a town hall format. Before that, Vice President Biden and Paul Ryan will face off at the vice presidential debate on Oct. 11. Amid the negative feedback on his debate performance, there was some good news for the president: Obama’s re-election campaign raised a record-breaking $150+ million in September. Romney’s campaign hasn’t released their September numbers yet. While there have been some reports that young voters are disengaged, a recent study found that more young people will vote this year than in 2008, and that most of them will be voting for Obama. It was confirmed Thursday that exit polls have been cancelled in 19 states. The surveys have taken place in all 50 states for the past twenty years.